Opening night was a success, as the audience applauded heartily during curtain call at these fine actors who delivered Chapell's play with the ingredients Chapell meant them to be. Trickster Victor Blake (Chris Dellinger), a Hugh Grant lookalike, was charming and funny when he visits his sister, Valerie (Sarah Arnold), who's always in his defence because her husband Kevin (Robert Sterling) knows that Blake's a conman who's just been released from prison. Blake finds out that his sister has a guest - an attractive and wealthy widow, Lucy (Tracy Labrosse). He sees this as a solution to his financial problems and deploys his charm and trickery to ensnare her. Included in his trickery are Soapy Simpson (Tom Kavadias) another ex-convict, Mr. Rogers (James Rha), a Jeweler and Mr. Turner (Rob Gillespie), a bank manager. The audience was delighted with this play and even applauded in some scenes. In the scene where Blake plays a Maori and gets Rah and Gillespie to imitate him, got laughs and applauses. Another scene that got an applause was Sterling tearing his portrait apart. 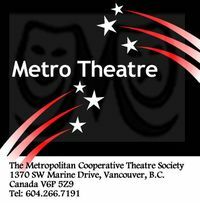 This play is Metro's season opener, and the company is out to a good start. The characters in this play were inspired by those in The Bounder, the TV series starring Peter Bowles and George Cole. Directed by John Hedgecock.